Buying a wifi cameras is a quick and often affordable way to improve home security, or just keep an eye on the dog when at work. If you're also looking for the best dash cam to fit to your car, we've got a separate guide for that too. Wi-fi security cameras come in many shapes and sizes, with feature sets and prices to match. At their simplest, they are cameras which connect wirelessly to your wifi router, then stream footage to a smartphone application. That way, you can boost your home’s security, or install a simple way to keep an eye on your children from the other room or an elderly relative. Extra features to look out for include infrared night vision, a flood light, motion detection, and ways of connecting to smart home platforms like Amazon Alexa, Google Assistant and Apple HomeKit, as well as the automation platform IFTTT (If This, Then That). Many Wi-fi cameras provide a live video feed for free, but then demand you pay a monthly fee to view recorded footage stored in the cloud. Some of these cameras are designed for use indoors, while some are weather resistant and can be installed outside. But be warned, as if you live in a rented property you’ll need to get the landlord’s permission before installing an outdoor camera. Similarly, if you live in a shared property, or an apartment with a door opening into a shared corridor, you’ll have to think carefully about where you place the camera and what it can see. The Logitech Circle 2 is a weather-resistant Wi-Fi camera. It is compact and designed to be used either indoors or outdoors, and has a claimed battery life of up to three months, based on two events being recorded each day. More frequent use will see this fall to 30 days, Logitech says, although a weather-proof power cable is available separately. The camera has a wide 180-degree lens, two-way audio, digital zoom, and night vision which works at a distance of up to 15 feet (5m). Footage can be viewed live via a smartphone app or web browser, and the camera automatically records footage and audio to the cloud when an incident is detected. Logitech’s Circle Safe platform offers 24 hours of cloud storage for free (meaning you can always view the last 24 hours of motion-triggered recordings without paying), then paid options start at $3.99/ £2.99 a month. A premium option, which costs from $9.99 / £7.99 a month, includes person detection, so it’ll only trigger when it sees a human, not next door’s cat, and the ability to prevent it recording footage from certain zones within frame. For example, an indoor camera could be set to ignore your dog’s movements between its bed and food bowl, but alert you if motion is detected by the door or window. Arlo is the wifi camera division of Netgear, which you’ll probably know for making routers. Instead of buying a single camera, Arlo is a system which at its most basic includes two cameras and a base station. Each camera records in 1080p Full HD resolution, has a 130-degree wide-angle lens, and automatic infrared night vision. The cameras also feature a microphone and speaker for two-way audio, so you can speak to whoever it’s looking at. These cameras are weather resistant, so can be installed outside, and while the battery lasts a claimed two to three months, you can buy an optional solar panel charger to negate the need to recharge. The cameras fire into life and start recording when they see or hear something, and extra Arlo cameras can easily be added to the system. Alexa integration means you can issue voice commands and view their live feed on an Amazon Echo Look smart display. IFFF integration means you could set the cameras to, for example, activate a flood light or even a garden sprinkler when motion is detected. As the name might suggest, this is a camera designed specifically for indoor use, so it misses out on waterproofing. But this means a more compact design and a smarter aesthetic. Nest is a smart home company owned by Google, and also sells smart thermostats, smoke alarms and home security systems which this camera can tie into. But looking at the Cam Indoor in isolation, it has 1080p HD video recording, 24/7 continuous recording to the cloud - where the last 30 days is saved - a speaker and microphone for two-way audio, and a range of mounting options for fitting it neatly in your home. There’s also night vision, a wide-angle lens, a simple status light so you know when it’s recording, and digital ‘zoom and enhance. There is no battery, so it needs to be plugged in all the time. But this makes it small, at just 11.4cm tall and 7.3cm wide at its base. Nest Aware cloud storage costs from $5 / £4 a month. This is a Wi-Fi camera, but with a dual-bulb flood light and siren included. Intended as an all-in-one security and burglary prevention system, the Ring Floodlight Cam has a 149-degree field of view, two 3,000 kelvin LED floodlights, and a 110-decibel alarm for scaring away anyone who trespasses on your property. The whole system is weather-resistant and is claimed to work in temperatures ranging from -30°C to +48.5°C, while the Ring smartphone app offers notifications and live view for free, meaning you can be alerted to movement and see what’s happening - from anywhere in the world - at no cost. Recording footage to the cloud for up to 30 days starts from $3 / £2.50 per month with the Ring Protect service. As well as shining a light, blaring an alarm and recording video, you can use the integrated microphone and speaker to talk with whoever the camera has caught. The camera integrates with the most popular smart home platforms, including Alexa, Google Assistant and iFTTT. Finally, there is a person detection system (so it won’t be triggered by animals), and customisable scheduling and motion zones, so it only alerts you when you want it to. Similar to the Nest Cam Indoor, this offering from TP-lInk is an indoor Wi-Fi camera not suitable for use outside. It has a compact design, so it shouldn't look too out of place on a bookshelf, or keeping a watchful eye on your baby’s cot. The camera records in Full HD, has a microphone and speaker for two-way audio (handy for shouting at the dog to get off the sofa when you’re out), free cloud storage for the last two days of recordings, and a smartphone app for notifications and live viewing. Smart home integration means you can view live footage on your Amazon Echo Show, Google Home Hub, or a television with a Google Chromecast or Amazon Fire TV connected. Video recordings are uploaded to the cloud for free, where they remain for two days. You can extend this to 30 days by paying for Kasa Care. The camera has night vision which works from up to 25 feet away, and the Kasa app lets you control a range of TP-Link smart home devices from one place, including smart plugs and connected light bulbs. Nest’s camera range is split into four sectors. There are indoor and outdoor options, and then for each of these there’s the regular Cam devices, and the smarter Cam IQ range. This is the Next Cam IQ Outdoor, which means it is the company’s flagship - and smartest - Wi-Fi camera designed for outdoor use. The camera can detect a person up to 50 feet away, then alert you through the smartphone app with a photo of their face. If you pay for Nest Protect the camera can also use facial recognition to tell you who it thinks they are, based on previous visitors. There’s a 4K sensor with HDR (high dynamic range) and what Nest calls Supersight, where a 1080p feed is produced from the 4K sensor; this allows for 12x digital zoom without losing too much quality, and extra detail in tough lighting conditions, like shadows mixed with bright sunlight. The IQ Outdoor is weather resistant, has infrared night vision, and a 130-degree field of view. However, it is not battery powered and so requires a power supply from an indoor socket. This will likely mean the need to drill through an external wall or the corner of a window frame, so you might want to consider paying for professional installation. You may not have heard of EZVIZ, but if you’re looking for an indoor Wi-Fi camera on the cheap, the Mini O Plus could be a strong contender. It works in a similar way to Nest’s indoor cameras, but has the added benefit of a microSD slot which can accommodate cards up to 128GB. This means you don’t need to pay for a cloud subscription, as video is saved locally. The camera is compact, at 13 cm tall and 6 cm wide, yet shoots in 1080p Full HD, has night vision, and a microphone and speaker for two-way audio. Amazon Alexa and the Google Assistant can both be used to control the camera with voice commands; for example, you can say “Alexa, show me the front door” to see a live view on your Echo Look or Echo Spot smart display. There’s no battery, so the camera must be plugged into a power source to function and it lacks water proofing so can only be used indoors. 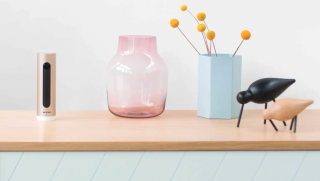 We know the appearance of your WI-Fi camera shouldn’t really matter, but we think the Hive View looks great - and in doing so, it’ll look less intimidating when sat on a shelf, staring at visitors. Aesthetics aside, the Hive View has a neat trick in that it can be used wirelessly for up to an hour. This means you can temporarily use it as a baby monitor, or to keep an eye on the kids playing in the garden, or adjust its location for an hour while you pop to the shops. Another benefit is that 24 hours of rolling cloud storage is free, so you can use the smartphone app to check up on footage recorded over the previous day at no cost. Upgrading this to 30-day rolling storage costs $5.99 / £3.99 a month for a single camera. The camera has a 1080p Full HD sensor with 8x digital zoom, a 130-degree wide angle lens, two-way audio, and starts recording when it hears noise or detects movement. French tech company Netatmo does things a little differently when it comes to the Welcome. There are no monthly fees with this indoor Wi-Fi camera; instead, it saves footage to an microSD card, or uploads it to your Dropbox account. This means no costs, and no need to deal with a third-party cloud service. Only screenshots of activity are saved to Netatmo’s cloud, which are then sent to your smartphone when movement is detected, so you can check what’s going on. The Welcome uses facial recognition and, once the system has been taught over a few days, it keeps a record of who walks past the camera, and when. You will only be alerted when an unfamiliar face is spotted, which then causes the camera to start recording to either the SD card or your Dropbox account. Another neat feature is how the Welcome can notify you via the smartphone app when it hears a siren, such as a smoke alarm or your burglar alarm. However, there is no speaker so two-way audio is not possible. A growing trend among Wi-Fi camera makers is to fit more features into their devices, in a bid to stand out from the crowd. Canary does this with the All-in-One by fitting the camera with a 90-decibel burglar alarm, artificial intelligence to learn your routine, and an air quality monitor. The latter works like a dedicated air monitor such as the Awair or the Foobot, and monitors the ambient temperature and humidity, as well as the general quality of the air in your home. That way, you van get a better understanding of when you should open a window to let fresh air in, or close the windows if local pollution is high. As for the camera itself, it records in 1080p, has a wide 147-degree lens with automatic night vision, and the last 24 hours of recordings are free to view online. To extend this to 30 days costs $9.99 / £7.99 a month, which is fine if a little pricey, but what’s annoying is how Canary only includes two-way audio (a standard feature on most cameras) with the paid-for package. In better news, the system’s AI claims to learn your habits and automatically arm the alarm system if you leave the home and forget.